Wheelchair basketball is fast-paced, action-packed and full of excitement. All athletes use a wheelchair basketball chair to play. Similar to the traditional game, wheelchair basketball only differs with a few rules that are specific to the use of the chair. Our game is played using 10-foot hoops on a regulation-size basketball court. For those athletes 12 and younger, the hoop is lowered to 8.5 feet. Wheelchair Basketball in the USA is governed by the National Wheelchair Basketball Association. Interested in finding more out about wheelchair basketball? Contact ParaSport Spokane! Never viewed wheelchair basketball being played? Click here to watch the 2014 NWBA Championship Game. Adult – A mixed squad of male and females with some junior participation. 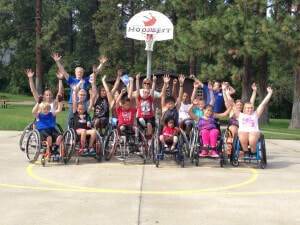 Women’s – Spokane boasts one of the largest women's wheelchair basketball programs in the nation! All ages are welcome! Juniors & Junior Varsity– These teams are for athletes up to their final year of high school. We have the numbers to justify two teams within our Junior program. Prep Squad -This team is for athletes under the age of 13. Futures (non-competitive) -Those athletes learning the ABC's of sport and moving their body with purpose. This group starts as young as possible and athletes will progress on to the prep squad when their skill level is sufficient to do so. ​This is a program for all athletes who are able to wheel in a chair and start learning the basic skills. Athletes as young as 16 months have participated. It is fun, active, and dynamic. Our volunteer staff are AMAZING! For a listing of ParaSport Spokane’s volunteer coaching staff, please see our Staff Page. 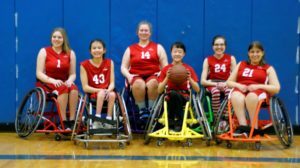 Lead by Head Coach Tomie Zuchetto, the ParaSport Spokane staff has over 40 years of wheelchair basketball coaching experience. Wheelchair basketball chairs are provided by the program. It is our goal for each athlete to have a chair to play in. We work to find grants, sponsors and sources of funding to be able to provide for our members. See our current needs on our Items We Need page. The teams are all seeking to qualify for the NWBA National Championships which will occur in various locations across the country. Saturday 10 am-noon for all b-ball athletes including futures! Stay tuned to our calendar page for practice updates. Wheelchair basketball is a great sport to showcase and for newcomers to come and try. Wheelchair Basketball is also a great team building activity for your business. Come on out to one of our practices; should there be enough chairs of the correct size for the athletes, able bodied participants are encouraged to give it a try. 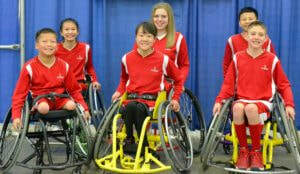 Give ParaSport Spokane staff a call to see if we are able to do a demo for your school/organization/group.